Somehow, my husband managed to receive a couple of hand-me-down French-speaking toys from a German colleague who lives in the Bay Area (not sure about the French connection, but not surprising given how multi-cultural the Bay Area is). When I say "French-speaking", I really mean speaking. The tractor in particular is very loud. It says things like "Hello, Good-bye", but it also has a few educational games. One is about finding the right key among a set of different colors and forms to start the tractor. The other is about fitting various farm animals in the trailer. The game explains the rules in French, and gives a lot of emphasis to the key words (e.g. yellow key, horse, etc..) in French. Daniel has become passionate about this toy, and I am very happy about it too. 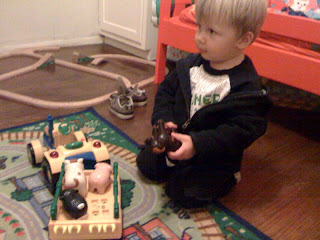 Obviously, the tractor + farm animal combination is a hit. All that Daniel loves in one package! Most importantly to me, Daniel loves to repeat the words he hears from the tractor. He had known most of the words in French for a few months now, but I think it's helpful to him to hear another source of French than Mama. It gives these words more importance, and he is so happy to repeat "cheval", "cle", "mouton", etc...) when the toy says these words. I think that when we go back to France over Christmas, we will be getting a few of these French speaking toys, so that Daniel has many reasons to continue speaking French. Another encouraging observation is that, even after spending most of the afternoon playing with this tractor in French, Daniel described the various pieces to my husband... in German. The one-person/one-language system seems to be working so far. Since it's been a while since I posted, I also wanted to note some other progress: Daniel seems to know most colors and shapes now. He described to me a "triangle" today, completely unprompted. I was very impressed. He is getting more patient now... I sometimes feel bad keeping him waiting long, now that I can afford it because he doesn't complain. However, the tantrums have gotten stronger too. Definitely getting closer to the 2nd birthday! Oh! How fun! I keep trying to get my mother to send me French Leapfrog toys, but she still hasn't done so. I'm not giving up hope though!